Today’s road trip took us from Custer, South Dakota, to Moran, Wyoming. In between, we experienced nearly everything Mother Nature had to offer: Wind, rain, lightning, thunder, hail, snow, sun…you get the picture. Speaking of pictures, we shot this one right outside of Douglas, Wyoming. 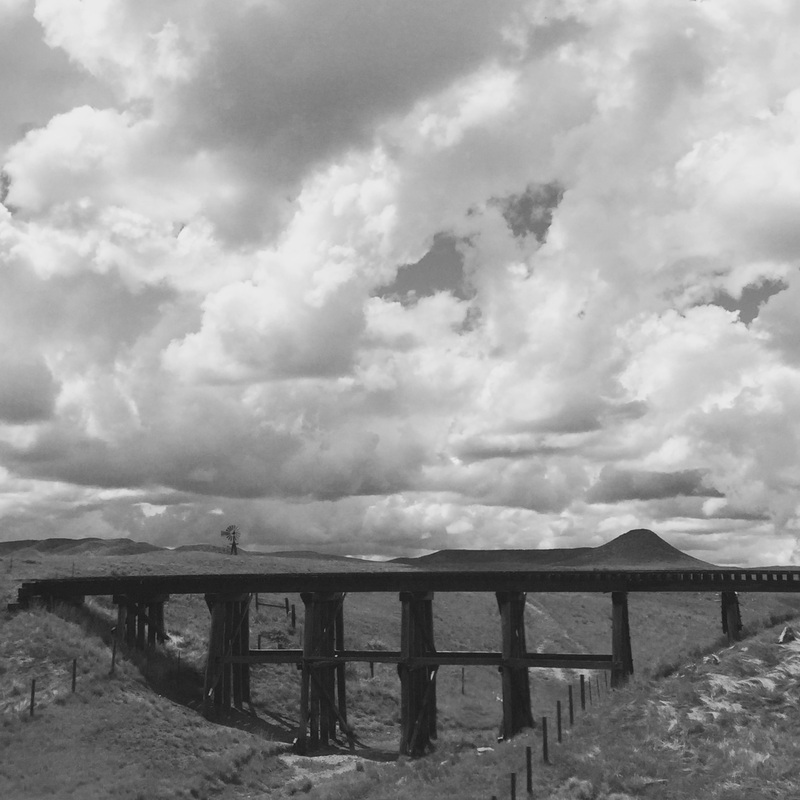 We loved the railroad bridge set against the distant windmill, mesa and cloud-filled sky. We were disappointed that we couldn’t see Mount Rushmore because of the rain, but we made up for that disappointment by enjoying a relaxing Sunday morning listening to Baroque music, reading The New York Times, and feasting on a traditonal breakfast of Bloody Marys, crisp bacon, scrambled eggs and toast. We hit the road around 11:45 and set our sights on Grand Teton. That meant driving amid the amazing topography of South Dakota and Wyoming. Heck, why don’t we designate both states as national parks and be done with it? The scenery was absolutely gorgeous, even considering we saw much of it through the lens of inclement weather. By the time we entered the Wind River Range in western Wyoming, we thought we had seen it all: spectacular peaks and plateaus, colorful forests and raging rivers, fantastic flora and abundant fauna. But we were wrong. As we drove along U.S. Highway 26, we were absolutely stunned to encounter the Teton range, with Grand Teton standing proud and strong like a giant exclamation point to the Rocky Mountains. No offense to America’s second national park, but Grand Teton’s beauty and grandeur eclipses anything we saw in Yosemite. Alas, as we arrived, the sun was setting on Grand Teton, and although it provided a colorful frame to the highest peak in Northwest Wyoming, we wanted to get a fuller picture. That comes tomorrow. First, when you walk dogs in the rain, they end up smelling like wet dogs, even after they’ve been dried off. Second, grills should be cleaned immediately after use. Third, tattoos are trending among young people on the Wind River Indian Reservation. A stop at the local Walmart confirms that even teenagers are inked up and ready for action. May 25, 2015 in Adventures, Cloud 9, Destinations.